mostly crafty. mostly. 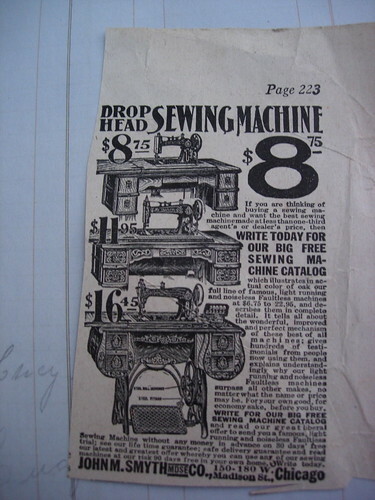 : sewing machines for sale! If you are thinking of buying a sewing machine and want the best sewing machine made at less than one-third agent's or dealer's price, then WRITE TODAY FOR OUR BIG FREE SEWING MACHINE CATALOG. John M. Smyth Merchandise Co., 150-180 W. Madison Stret, Chicago." Found in the ledger/scrapbook I was freecycled. I wonder if Lucy (her name is right behind the advertisement) ever got one?